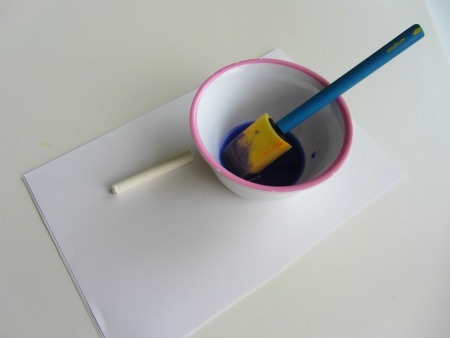 Crayon resist painting is a classic children’s art project and this is how we turned it into an alphabet activity. 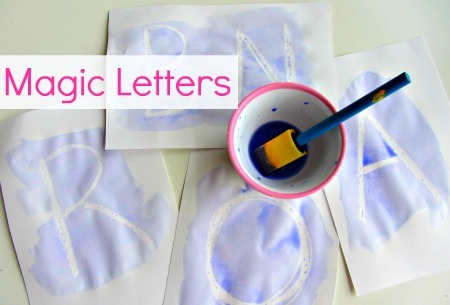 Our spin on the classic crayon resist is a fun way to learn letters by magically making them appear when painting the paper. We may know it’s not magic but I dare you to tell a squealing toddler that its not. 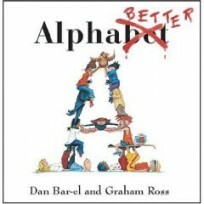 To them it’s alphabet magic. This is the 6th installment of our Alphabet For Starters series, posts dedicated to introducing and playing with letters for beginners. 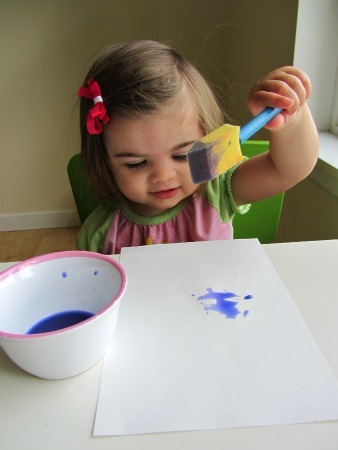 Gather your materials, you will need some water colors, water, a paint brush, white paper, white crayons and scissors. Start by cutting plain paper in half. I found that making them a medium size was just the right size for her to paint and not lose the excitement of discovery. Write letters in upper or lowercase in white crayon. I went over the lines a few times to make them nice and thick. Do not try to do every letter in one sitting, it will take a fun activity and make it daunting for many kids. Instead have the materials on hand to make more in a jiffy if they are super into it. My daughter kept asking for the letter R so we made a few of those. Mix the paint. 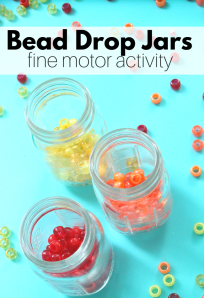 Now The best paint is watery so it beads off the crayon easily. I mixed the paint brush in water color and riced it in the water a few times then used the water as the paint. 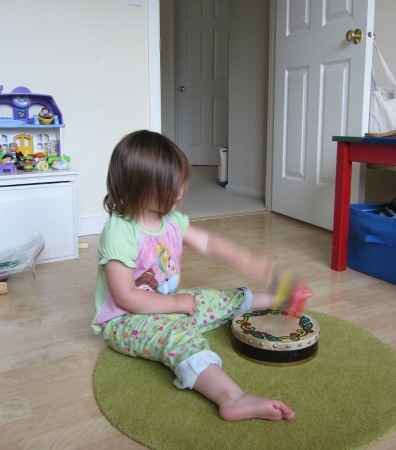 I am often asked what my kids do while I prep or if I prep the night before ( you overestimate my competency if that’s what you think) – no I set something out for her to play with like these instruments and then invite her to play when ready. Time to Paint. She was not sure at first. O! 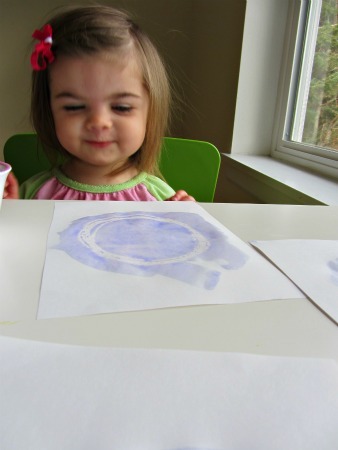 She had fun and later while playing in the playroom she sat at the table and re-did the activity with a dry brush and the dried paintings. A sure sign that it was a hit. 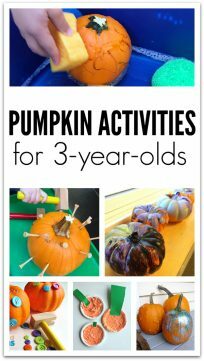 This looks like a lot of fun — my little ones already enjoy painting, so I know they’ll be thrilled the second they see the paints out. 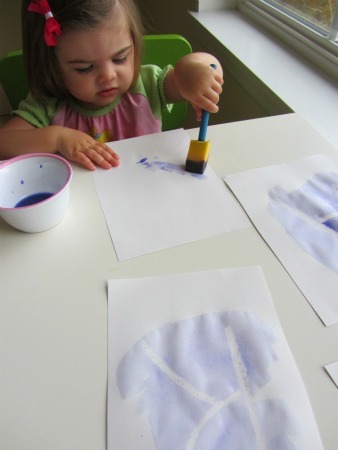 I can also see doing this with numbers, CVC words, shapes…. love it! 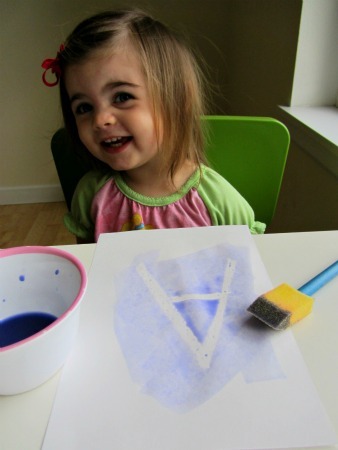 What a great idea to practice letters, your daughter looks like she is thourghly enjoying it! My kids love using crayons and paint. Have a great week! Okay, that is pretty darn cool. I gotta go find me a white crayon now! I’m sure there’s one somewhere in the house lol. Have to try this soon. Logan (same age as yours) also loves “A” “O” and “T” and “E”. Now I am trying to figure out why they are so attached to those letters – fascinating! I love this activity, Allie! J will love it! This is ” magical”! The children will love it.. Thank you! Your daughtervis darling and so engaged! Awesome! Love this idea!!! Definitely going to try it out soon. Thanks! It is with your permission? Thank you so much. No that company does NOT have my permission. I sent them a notice to remove it immediately. Thank you !